4:30 AM, I woke up by the sound that a some huge animal walked about. It was doing something just by my tent side. I thought it was a bear or a moose due to a sign of its hugeness. 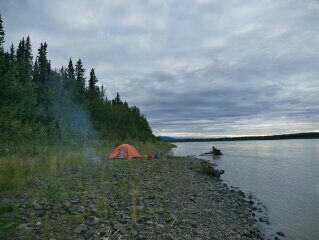 After few minutes, breathing hard through the nose, it entered into the river with a loud splash and then went through by my tent side. I could not open the zipper of the tent to confirm that figure in order to avoid surprising it and then being attacked. There was no footprint of it on the pebbly shore. I searched around, found a footprint of hoof 150 feet away and not found a footprint of a bear. It is not a direct evidence but I think it was moose.